How aware are workers and businesses of factors in the workplace that may impact work health and safety (WHS)? A July 2015 report Mindfulness of WHS in the Workplace by Safe Work Australia (SWA) looks at mindfulness among both businesses and workers when it comes to WHS. “Mindfulness” is the conscious awareness of factors that affect health and safety in the workplace. Overall the report found “generally high” levels of mindfulness across worker groups in terms of what businesses count on, sensitivity to operations and preoccupation with failure. Small and medium business employers (88% and 87%) were slightly more likely to agree that everyone feels accountable for safety than employers in large businesses (73%). Almost all large business employers agreed that their business spends time identifying how their activities could potentially harm their workers, compared to 85% of medium business employers and 71% of small business employers. A continuing area of concern reaffirmed in the latest report was a tendency by businesses to approach WHS prevention reactively (such as treating a near miss as useful information) rather than proactively (such as spending time to actively look for possible failures). The favouring of a reactive approach to WHS incidents by Australian businesses is potentially an important insight into the ways in which Australian businesses manage work health and safety. The report suggested this may be due to businesses not having the resources available to proactively assess their workplace for potential threats to safety (preventing incidents before they can happen), or this may simply not be a priority for businesses. A proactive approach to WHS does however appear to be undertaken within those priority industries that have relatively high inherent injury risk (such as construction), suggesting that potentially catastrophic events may be proactively mitigated where they are most likely to occur. Workers’ compensation claims data show that the construction and manufacturing industries had the greatest decrease in incidence rates of the priority industries over the period 2000-01 to 2011-12, with transport, postal and warehousing also experiencing a substantial decrease (Safe Work Australia, 2014). Generally, taking a largely proactive approach indicates a good level of mindfulness with regard to preoccupation with failure of work health and safety in the culture of these workplaces. Differences were present according to industry and occupation groups across worker types. Employers operating in the health care and social assistance industry, for example, tended to have the lowest levels of mindfulness in terms of what they count on in their business, preoccupation with failure and sensitivity to operations compared to the other priority industries. Sole traders working as labourers displayed high levels of mindfulness across the three measures. While businesses and workers all had high levels of agreement that when something unexpected occurs they always try to figure out why things didn’t go as expected, agreement was much lower for businesses actively looking for failures and trying to understand them. Employers in manufacturing, transport, postal and warehousing and construction did appear to support both proactive and reactive approaches to work health and safety failures, with sole traders in the manufacturing industry also supporting both approaches. Workers in these industries tended to favour the reactive approach. 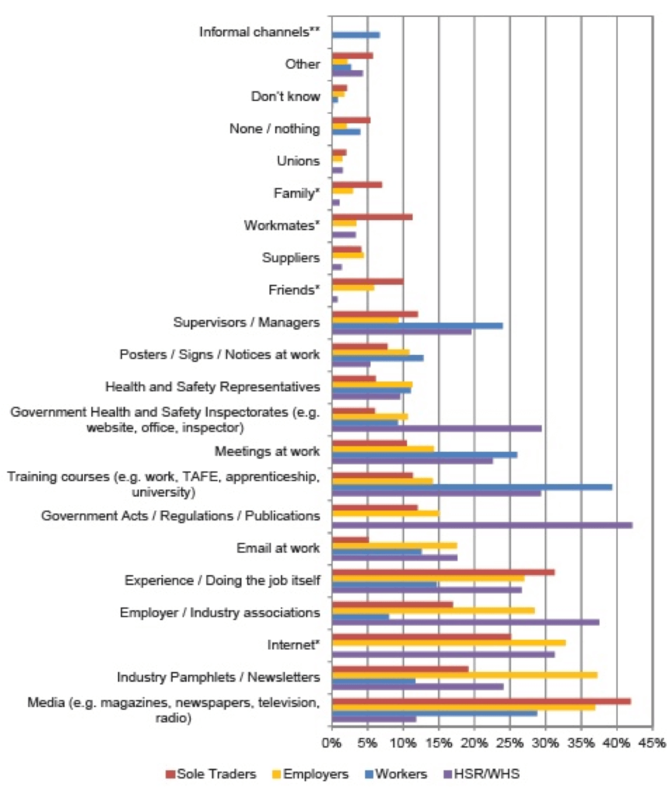 When it comes to sensitivity to operations in the workplace, employers operating in the accommodation and food services; transport, postal and warehousing and construction industries displayed consistently high levels of mindfulness with regard to sensitivity to operations in their workplace (see Figure 1). Employers had a higher level of agreement “the business actively looks for failures of all sizes and tries to understand them” (65 per cent) compared to workers and sole traders (57 per cent each). Workers were less likely to agree that “workers are rewarded if they report potential trouble spots” (24 per cent workers and 35 per cent employers). Sole traders had slightly lower levels of mindfulness overall while workers had slightly higher levels when it comes to preoccupation with failure. Workers had a much higher level of agreement (75%), with the exception of “the business often updates our procedures after experiencing a near miss” than employers and sole traders (61% and 55% respectively). Employers also had a slightly higher level of agreement for the business actively looking for failures of all sizes and tries to understand them (65%) compared to workers and sole traders (57% each). Employers and workers had almost identical agreement with workers being encouraged to report significant mistakes even if others do not notice a mistake has been made (85% each) and workers are encouraged to talk to superiors about problems (87% employers and 88% workers). Workers were slightly less likely to agree that managers actively seek out bad news (31%) compared to employers (37%) and less likely to agree that workers are rewarded if they report potential trouble spots (24% workers and 35% employers). This indicates that while workers are encouraged to look for and report potential problems they perceive that employers are less concerned with this. Employers tended to be more mindful in terms of sensitivity to operations than sole traders when it came to constantly monitoring workloads and reducing them when they become excessive (77% and 60%) and having access to a range of solutions whenever unexpected surprises crop up (80% and 61%). This may be related to businesses having greater resources available to be able to deal with these situations. Both groups had similarly high levels of agreement that on a day-to-day basis there is always someone who is paying attention to what is happening (85% sole traders and 91% employers). While there are generally high levels of mindfulness among all groups, another study undertaken by SWA has shown that the top two perceived causes of injury nominated by employers, sole traders and workers were ‘the worker being careless’ and ‘just not thinking’ (Safe Work Australia, 2015). In another study it was found that over 20% of sole traders and workers and just under 20% of employers agreed that they regarded risks as unavoidable in their workplace (Safe Work Australia, 2014a). One explanation for these seemingly divergent findings is positive bias associated with responding to the mindfulness items within the survey (i.e. wanting to promote a good impression by agreeing with items when this may not be the case in reality). Another explanation could be that while employers, sole traders and workers are generally quite mindful of work health and safety in their workplaces, they occasionally experienced failures in attention which lead to incidents occurring, or perhaps as a result of inherent risks existing in their workplaces from the nature of the work or the way in which it or the workplace is designed. SWA says further research into the impediments to practical application of these general high levels of WHS awareness on a day-to-day basis to prevent workplace incidents and injuries would enable the establishment of an evidence base of the impact of conscious awareness of WHS on workplace incidents and injuries. SWA says the comparatively low levels of mindfulness observed for employers within the health care and social assistance industry “is of concern.” However, the findings could reflect that the work health and safety policies and procedures used in these workplaces did not allow for the regular assessment of potential failures or the updating of policies and procedures following a near miss. In addition, the positions held by workers in the industry may not allow for workers to solve unexpected problems or a range of solutions to be available if something unexpected occurred. Workers’ compensation claims data show that the health care and social assistance industry had the highest number of serious claims in 2012-13 (preliminary) of all industries, and that there has been a 29% increase in the number of serious claims over the period 2000-01 to 2011-12 (Safe Work Australia, 2014b). Investigation into work health and safety mindfulness in the health care and social assistance industry, such as the system of work health and safety used and the nature and application of relevant policies and procedures used, may shed further light on patterns of workplace injury and illness in the industry. SWA said the finding that sole traders working as labourers had high levels of agreement across the three measures of mindfulness indicated that this ‘hands on’ occupation group appeared more mindful of work health and safety in their workplace due to the inherent risk associated with their work or the greater potential consequences of failures. This finding is also in line with labourers having the highest level of agreement that they never accept risk taking even if the work schedule is tight compared to other occupation groups (Safe Work Australia, 2014a). The study suggests that high levels of mindfulness with regards to work health and safety, and specifically taking a more proactive approach towards risk management, may be contributing to recent reductions in accidents and injuries within the workplaces. However, this requires confirmation through further empirical study, SWA says. AlertForce offers a range of courses to help businesses better target their WHS approach – and more actively look for system failures. They include Communicating Safety in the Office, Leadership Skills for Supervisors, Managing Hazards and Risk (Construction Safety) and Risk Management Safety Essentials Course.